"Going to get started on my homework!" I yelled, grabbing my sandwich and a glass of milk. I ducked down the hall and into my bedroom, kicking the door shut behind me. Right away, I noticed something wasn't quite right. I'd tossed the Navy peacoat on my bed when I first came home, but now it wasn't there. The hair stood up on my neck, and I got goose bumps all over. Of course there were no such things as ghosts. But there was somebody in my room! I yelped when I saw him, and sat straight up. He was leaning against my bedroom door, holding the navy peacoat. He pulled something out of the peacoat pocket--an envelope. An encounter with a ghost from World War II was not on Anderson's mind when he promised to clean up a basement storage room underneath Uncle Dex's antiques shop as a practice room for his band. But the old trunk caught his attention, and after his friend Greg left, Anderson couldn't resist opening it. Inside he found an old Navy peacoat and other dusty old military stuff. Feeling suddenly chilly, he impulsively pulled on the coat. And then he could have sworn he heard someone softly saying, "That's mine." But there was no one there, and resolving to ask his history buff uncle about the old chest, Anderson couldn't help anxiously looking behind himself as he hurried up the stairs and out to his bike. But Anderson knows, he just knows, that the filmy figure in old-fashioned denim shirt and bell-bottoms who appeared in his room is some sort of ghost. And it seems he is there for the letter inside that smudged envelope. "I might have written this to Betty. Betty was my girl. Way back before everything happened. About all I remember is there was a war against the Japanese and Germans, and I was on a ship. Seems like I've been wandering a long time... kinda, well, limbo is what I guess you'd call it. Then you found that coat and put it on and that brought me here." The ghost seems to falter and soon fades, but Anderson can't stop thinking about the mystery the ghost has handed to him. He decides to enlist his friends, Greg and Julie, and Julie is eager to trace the identity of the young sailor, beginning with the letter to Betty. With the name on the envelope's address, Julie tracks Betty down. She is in her nineties, but clearly remembers her first love, William Foxwell, who was among the many seventeen-year-olds who signed up for military service immediately after the attack on Pearl Harbor. And with that clue, the three history detectives are off on their mission to find out William's fate, an investigation which leads them to the Battle of the Coral Sea and on to the pivotal Battle of Midway and William's subsequent capture by the Japanese. Julie's internet searches lead them to books and finally to an elderly Japanese eyewitness of William's capture who provides the final heroic ending to William's story and the release his ghost seeks. Steve Watkins' Ghosts of War #1: The Secret of Midway (Scholastic Press, 2014) offers appealing and believable young history detectives and plenty of exciting historical details that will encourage young readers to follow in their footsteps into the many fascinating stories of that war and the personal memories that remain of that time. 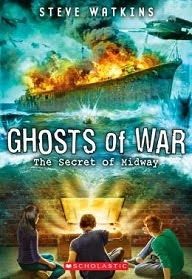 Watkins' characters are thoroughly modern kids who deal with eighth-grade bullies while experiencing the details of sacrifice and death in the larger world this "ghost of war" introduces to them. Military history buffs won't want to miss Watkin's sequel, forthcoming March 31, Ghosts of War #2: Lost at Khe Sanh (Scholastic Press, 2015). Maturing fans of The Magic Tree House books will move easily into this series, and it also promises to offer the appeal of Dan Gutman's best-selling Baseball Card Adventures which take their baseball-loving character back into the real history of the sport with such greats as Honus Wagner, Babe Ruth, Roberto Clemente and Ted Williams.